This necklace is one I sold quite a lot back in the dawn of pre-history. I was making and selling jewelry to various boutiques around the country and since the internet hadn’t yet been invented and the whole idea of costume jewelry that was NOT bright gold with giant fake stones was a novelty this was a popular little fetish necklace. That’s what I called these; Fetish Necklaces. There were other animals, all were constructed in a similar manner. The intention was that you’d layer this up with several other fetishes. Because way back when, neo-Victoria, steampunky, romantic tribalism was totally new. Okay, maybe what I mean is that it was uncommon. There were a few of us out there; Kaari Meng, Arlon, Jill Schwartz and others. We made fancy romantic jewelry you could wear with a pair of silk-velvet overalls, a striped long-sleeve tee shirt and laced-up Gibson-girl boots. I had lots of black eyeliner, an armful of sparkly bracelets and crazy big fuzzy hair. Okay, so nothing much has changed there except for the eyeliner. 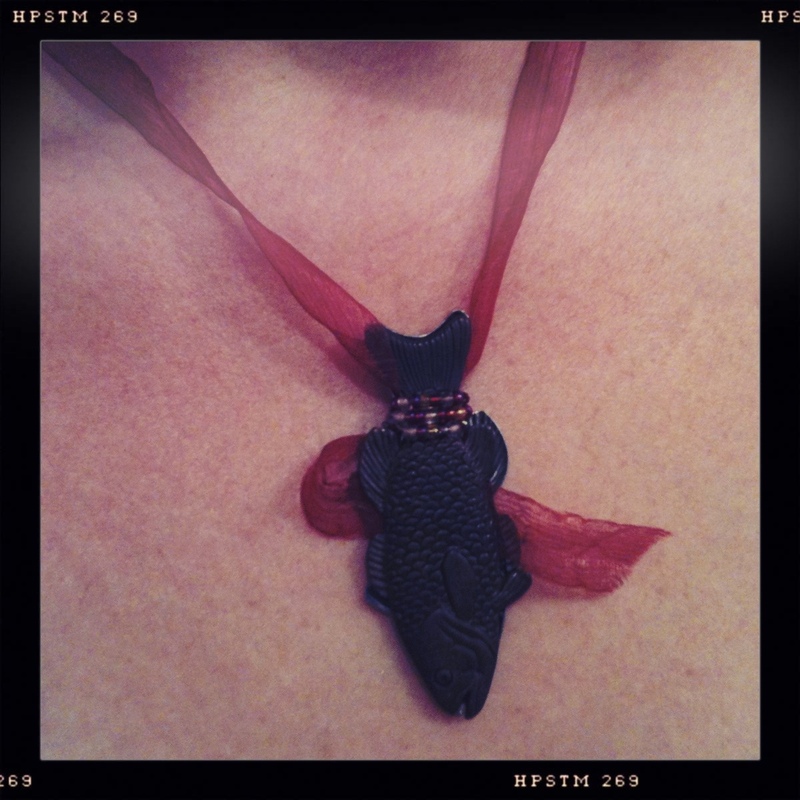 This necklace is made from two stamped brass fish, back-to-back, with silk organza ribbon and a wrap of seed beads and wire. I am almost embarrassed to say that this little beauty sold for the wholesale price of $21. Now, the ribbon IS 32″ long, so you can wear this long OR short. There is a small amount of glue there holding the fish together should the wire-wrap ever fail. And did I mention that it was SILK organza? But still, $21? That makes retail price somewhere around $42. A pink silk ribbon holds a pendant made of resin in one of our bezels. Bit of Italian wrapping paper in the bezel, plus a key and a crystal. Sorry the photo isn’t very complete. I took this one myself. Sometimes when you get dressed in the morning you have to plan on a lot of disparate activities crammed into a busy day. This is a favorite theme in shopping-centered magalogs like Lucky and Glamour; Five Wardrobe Basics That Take You From Office To A Night Out. The problem is my day is never that simple. Office to Night Out? That’s only TWO outfits. I can do that, easy-peasy. Today I had to go from Good Daughter-In-Law/Mother to Storm Chaser to Chef with one outfit. 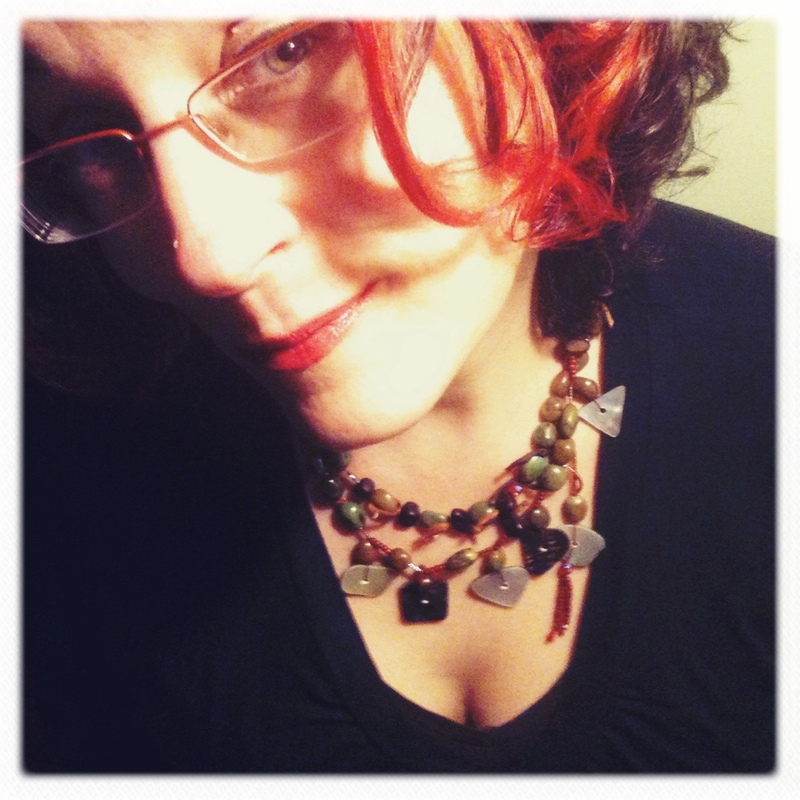 I decided to wear my ‘Crafty’ necklace in case I got sidetracked and needed to remember who I usually am. Oh, and my family made it thru the storm just fine, but we’re mourning the North Carolinians who didn’t. This necklace was made by Tracey Johnson (see yesterday for the link) out of hand-dyed silk cording. 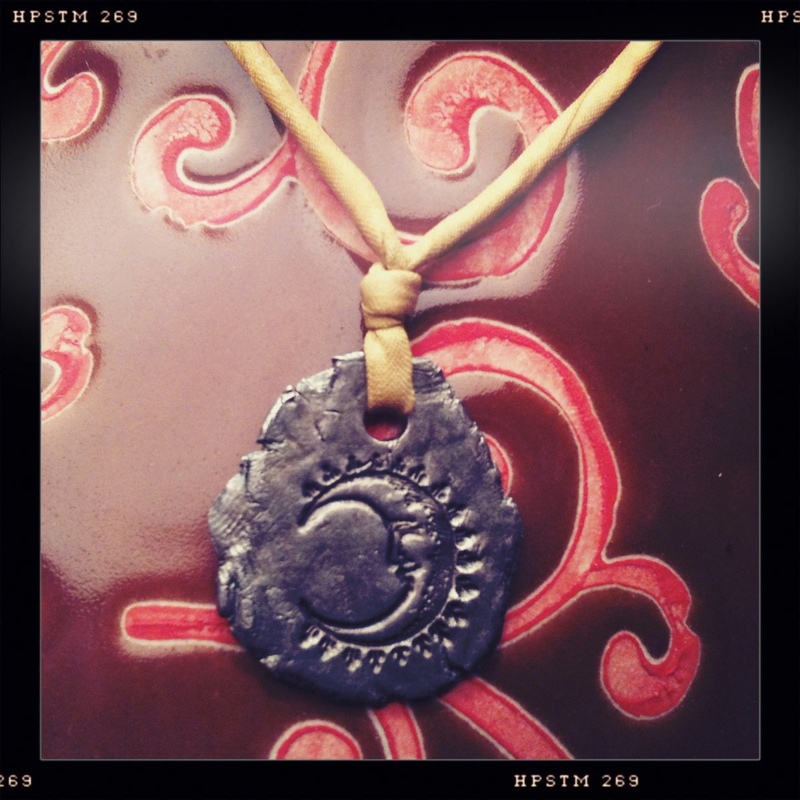 That brass disc features a natural patina and is stamped with the word ‘crafty.’ the silk and accent bead are red, my favorite color. You can’t see it in the photo but the silk is knotted into chain and the clasp in the back, an elegantly simple solution that is one of my favorite finishing techniques. 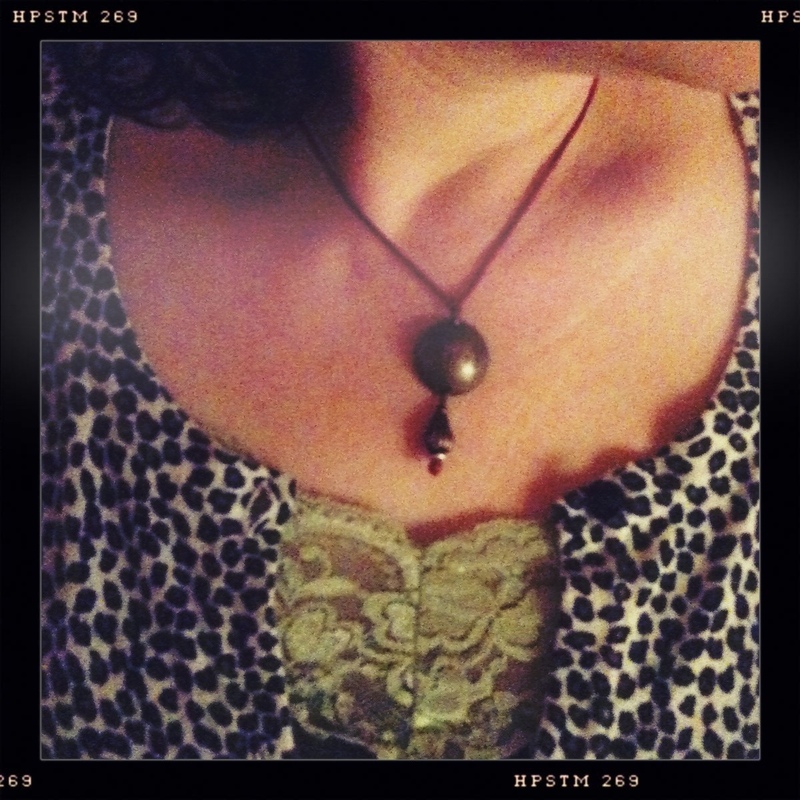 This necklace is a simple charm made of Art Clay Silver strung on a length of acid-green silk. I made the charm. It is one of the few metal clay pieces I have made. I really wanted to love that medium, but somehow I realized I’m more of a collage artist and not a sculptor. It just always felt weird and I never loved what I made the way I often love the charms and pendants other people make. It was just a rubber stamp I borrowed and pressed into the clay. I fully intended to give this charm as a gift to someone but then I wore it one day and looked in the mirror. That moon looks like a perfect letter ‘C’ in the mirror. I loved the idea of a secret initial as I’m not exactly the type to wear a monogram most of the time. But secrets, I love secrets. That acid green silk is just knotted or tied at the neck. No clasp. I usually wear this necklace daily when I take a summer camping trip. Never take it off. Wonder how I’ll handle that this year. Rainy, rainy day today and I really wanted to curl up in bed and stay in. I couldn’t, for various reasons that all boil down to ‘setting a good example’ so I put on an orange tee shirt and a stripey tee shirt and some jeans. This necklace is simple and easy to wear with a clash of layered cottons; the larger beads don’t get lost on the pattern of the shirt and it’s comfortable. The beads range from vintage to contemporary Czech glass, handmade Humblebeads by Heather Powers and some ceramic Elaine Ray beads and even a few stones. They are all simply wire-looped on 20 gauge copper wire and connected, rosary-chain style. I like that type of connection because it is flexible and shows off the beads. The red silk cording along the back is finished with a hand-made copper hook and a square copper jump ring. 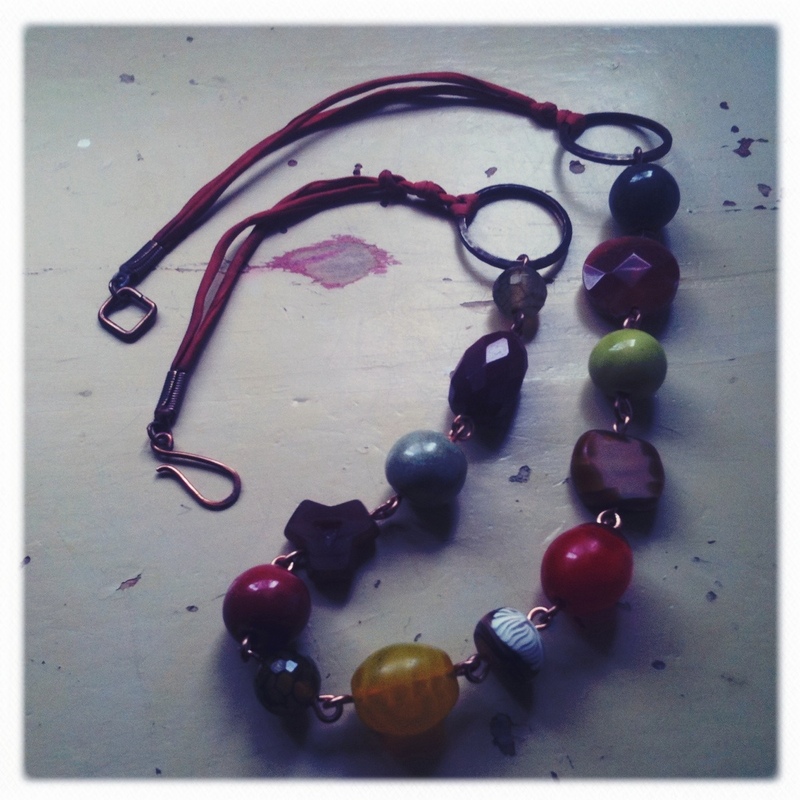 I do like the bright reds and oranges mixed with green/yellow in this necklace. I usually wear this one quite a lot, both on it’s own and layered with other pieces. This necklace is made of olive-green Tibetian turquoise, abalone-shell discs, Toho seed beads, wood and bone all strung on #6 knotting silk. I made it many years ago in an afternoon of beading with my younger sister. I started with a big, blown-glass focal but pulled it out and added more stones, wood, seed beads. She watched me put it together and at some point said something like ‘wow, if I made that it would look really bad.’ That’s one of those compliments that you think is maybe not so much of a compliment. But she IS my sister, so I know what she is saying. Weird, busy, odd, layered, asymmetrical. Those things all come easily to me. What’s hard is order. Patterns. Matching. Making a 16″ strand of graduated pearls would drive me nuts. I don’t know if it would be boredom or just impatience. I would go crazy. However, hand me a bunch of probably-not-matchy beads and some thread and I’ll string ’em up. I’ll add dangles and maybe a tassel. I can’t help that. Now, in my current profession, that’s pretty good. It’s okay to not be matchy. Or pattern-ish. There is, however, another side to that coin. I can’t follow recipes. I have trouble assembling items using any kind of written directions. I space out when I’m trying to make a dress from a pattern and start thinking ‘don’t I really want a skirt?’ Because I’m so frenetic it takes me a really long time to learn from my mistakes. I will try and try again but I’m more like a squirrel than a scientist. I don’t carefully adjust one variable at a time and see what happens. I adjust seventeen variables and then throw in a new color of seed bead and see what happens. Luckily for me, sometimes I like the result.